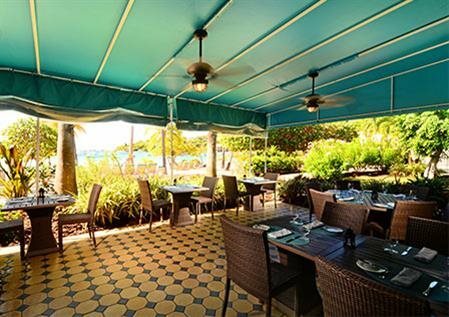 The Caribbean Food Market is one of the finest seafood restaurants in the US Virgin Islands, back in business after damage from two hurricanes in 2017. 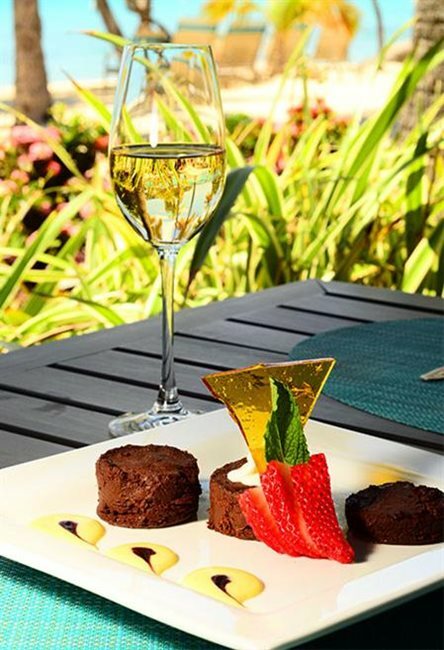 It’s located a short walk from the Ritz-Carlton, which will re-open this summer in the southeast coast of St. Thomas. Because nighttime lighting disturbs local animals, the island is dark after hours, and you’ll get the best ocean view, which is dramatic, by coming at sunset or earlier. But even at night there is a great ambiance to the Caribbean Fish Market, which sometimes lights tiki torches. You can ask to be seated indoors, or on the outdoor deck, though there you may find yourself downwind from the smoking area. The space is upscale and open, with fans spinning overhead in the high roof, and tile flooring below. It’s comfortable and genuine. Our evening began with their playing easy listening music, and accelerated as it got later to Top 40 and then house music. Fortunately, the music was quiet enough to easily have a conversation over it, especially outside where thankfully there were no speakers playing. You’ll find yourself bonding with the night and the breeze coming off of the hidden water that you can sense more than see out there, the crash of the waves soothing you. Our server was a treat, an oversized personality named Mr. Big Life, who welcomed us warmly to the island and gave us his Caribbean philosophy of easy living. Meeting him was striking and he was quite a character, more so than any other server we encountered on our trip. He likes to say, “That’s is life,” or, “Life is amazing,” or, “I got you covered.” He made our meal feel more authentically island while also putting us at ease. 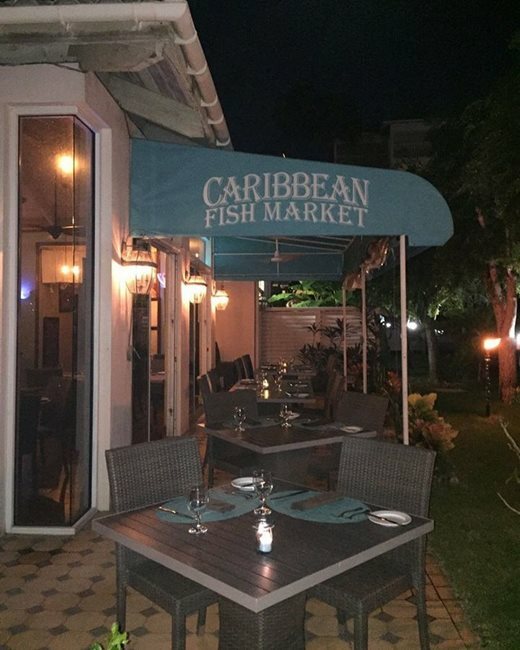 At the time we visited, January 2019, the Caribbean Fish Market had just switched from a more basic menu, provided while still recovering from the hurricanes, to a full menu which was new and still being refined. They’ll bring out a big bottle of sparkling or still water, but to save expense you can also just ask for regular tap water. You’ll find a wide range of cocktails, martinis, and beers, and an outstanding menu of unusual island tastes. For starters, have the Eggplant Lollipops, Apple Gorgonzola Flatbread, Korean Wings, Lobster Wonton Ravioli, or Drunken Mussels, which are mussels in a broth of onions, bacon, and white wine. 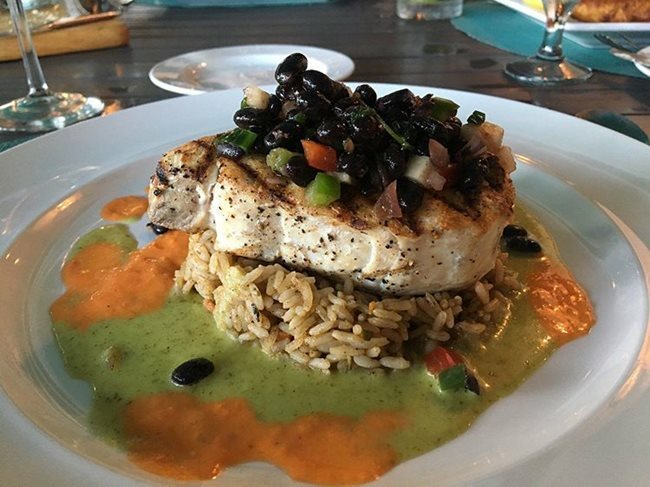 For an entrée, try the Apple Bacon Pork Chop, Caribbean Stuffed Lobster, Shrimp Penne Pasta, Diver Scallops and Clams, or the USVI Wahoo, the wahoo being a local fish grilled medium rare atop rice noodles with mushrooms, hoisin sauce, and wasabi cream. Or get the Butter-Broiled Lobster Tail, which comes with a cream sherry sauce, garlic mashed potatoes, and grilled asparagus. We got the Caribbean Fish Market Crab Cakes as appetizers. They have a soft mouth feel. Instead of chewing you just let it come apart in your mouth, very moist and with peppers inside. They seem baked rather than fried, which is good because they weren’t oily, but the top wasn’t crusty and crunchy. Instead the crab cakes were flakier and moister than you would expect. They came decoratively presented with pineapple salsa atop a leaf, which added sweetness but not spice. We also tried the Ahi Tuna Nachos, which were not for us. The nacho chips were very airy, with little bubbles making them more a chew than a crisp bite, the kind of crisps that you would expect with a crab Rangoon rather than a nacho. It comes with raw tuna with a red spice that wasn’t enough to mark it, drizzled with seaweed salad and mango salsa. It’s a mixture of tastes. It’s definitely a mixture of textures. You have to eat it mostly for the tuna, not mostly for the chips. For a main course, we ordered the Surf and Turf, a grilled filet mignon steak with butter-broiled Caribbean lobster tail, in a sherry cream sauce. It comes presented on a square, white plate, with the surf and turf stacked up. The meal should come on a smaller plate to give it a larger feel, or with some decorative garnish. It’s lobster tail and a steak the size of one’s palm on a bed of mashed potatoes, sprinkled with onions and garlic in a gravy reduction that will alert your senses, a sharp offset to the meat. The high-quality steak needs no sauce. It has a delicious chew to it, not being stringy or fatty at all. It’s just a pure wedge of goodness. And the potatoes have a complicated and delicious texture, with little nuggets of potato like they’ve been hand-mashed. The lobster had me exclaim “Oh, wow,” involuntarily. 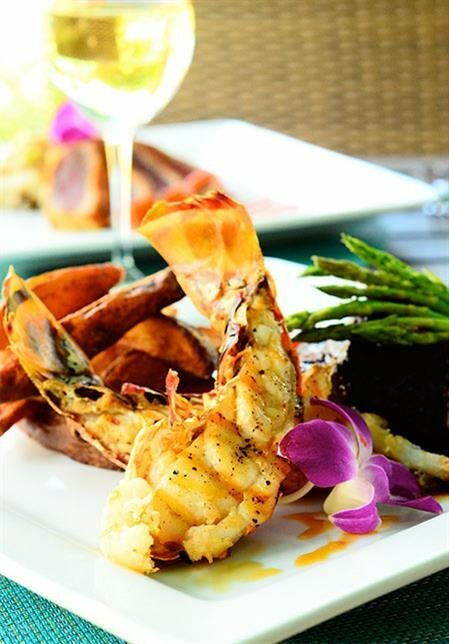 Unlike a whole lobster which must be cracked open, the lobster tail is served partially exposed and easy to access. You just have to get your fork and knife in there. It tastes so fresh, wholesome, and buttery. It is packed with flavor, and the zucchini and mashed potatoes could perhaps use some more spice, but together they are hearty. It really feels wholesome, like you’re eating something nourishing, not fatty. You feel uplifted. The Crab-Crusted Grouper comes in a cream sauce, stuffed with the same crab cakes dish we tried earlier, which was an interesting blend. The fish is warm and flaky in your mouth, but the spice was subtler. Having less spice made the meal less notable but avoided the danger of an over-spiced meal where you can’t actually taste the meat and potatoes. We also tried the Lemon Half Chicken, an alternative meal in such a prestigious seafood restaurant. The chicken was spicy and juicy, with the zucchini is not completely cooked, giving it a firm chew. There’s butter melted into the mashed potatoes. It’s a comfortable and familiar dish for tourists unsure of their tropical location. As with every dish, it’s presented on a simple white plate. For dessert, try the Ginger Creme Brulee, the Ice Cream Waffle Sandwich, or the Tres Leches Baked Alaska, which is ice cream over angel food cake, with strawberry and chocolate sauce. Their ice cream, they say, is made fresh in-house. We got the orange cheesecake. Wow! They must grind an orange rind directly into this, which was the most unique cheesecake I’d ever tasted. Most cheesecakes are dry, and adding strawberries is never enough to compete with its heaviness and denseness. With this dish, the orange is just sort of infused into the cheesecake itself, making it fluffy as well as dense. The basic taste of the cheesecake is a great offset to the sharp taste of the orange. However, the crumb bottom to the cheesecake was smooth and thin rather than giving a crunch. The walnut rum cake has chocolate drizzle on it, which is interesting, and little bits of walnut in it. Serve in a separate bowl, the homemade ice cream has tiny frozen particles in it, making an interesting texture, with a minimal chocolate drizzle. The rum cake was not as moist as expected, and might have come heated. The Caribbean Fish Market features eye-popping views before sunset, an excellent environment and service, and a large menu with an interesting, if perhaps needing more spice, diversity of meal choices. I’m glad to give the Caribbean Fish Market a perfect five stars.